Both simulating history and rewriting it, Hearts of Iron 4 is the essential strategic wargame. What is it: A globe-spanning grand-strategy World War 2 wargame. Every Paradox grand strategy game tries to capture the essence of an era: the rivalries and discoveries that defined it, the way they reshaped the world. In Hearts of Iron 4, all roads lead to global destruction as players use all the tools of progress to win a spectacular international deathmatch. The important distinction between Hearts of Iron 4 and the rest of Paradox's strategy lineup is that Hearts of Iron is a scenario, not a sandbox. It's a very big, very complicated scenario that can play out many, many different ways, but it's not the open-ended playground of Crusader Kings or Europa Universalis. Those are games where the Iroquois can conquer the world, or the Viking can become the militant defenders of the Zoroastrian faith. Here, your options are more stark: as Germany, do you want to attack Russia now or wait until they attack you first? To quote Kierkegaard on the matter, "Hang yourself or do not hang yourself, you'll regret it either way." Outside those big, pre-war questions of alignment, and who is going to get it in the neck first, Hearts of Iron 4 is primarily a globe-spanning wargame. At one moment you can be micro-managing a pincer attack on Moscow, controlling one division at a time, and then you can zoom the camera out to encompass a whole hemisphere as you arrange an assault along a front line stretching across all of Africa. While you'll spend most of your time making giving orders, and reassigning fleets and fighter squadrons, you always have to keep an eye on the industry, resources, and technology that will allow you to sustain the war. It's not exactly the romance of the Desert Fox and Overlord, but I found managing my production lines and army composition to be enormously satisfying (perhaps worryingly so). Hearts of Iron 4 is a game of incremental decisions that take on mass and momentum to change the course of history. You might decide to pass on producing an entire generation of heavy tanks to try and roll-out more advanced models before anyone else, but that means losing over a year of production time where your armored divisions won't be able to field heavies, while your opponents have the trump card on the battlefield. But that painful trade-off is only the beginning of your difficulties. When you do get the designs you want, you need to dedicate precious factories to building them, and I promise that they're probably all building something else that's war-critical. You can always re-task factories to building new things, but Hearts of Iron punishes players who don't anticipate their needs effectively by making factories get more efficient the longer they produce the same thing. You want to leave production lines untouched for as long as possible, but that also makes it hard to replace obsolete weapons with newer models. The joy of Hearts of Iron is making those high-level compromises between the army you want, the army you have, and the army you can produce. It's a rewarding problem to try and solve, but it's also a perfect one for the armchair strategist. The joy of Hearts of Iron is making those high-level compromises between the army you want, the army you have, and the army you can produce. Do your job well, and your troops will have a few key advantages when they enter combat, and weaknesses that you've anticipated and can compensate for. Do it poorly, and units will slowly wear-out as equipment replacements dry-up, while ceding one advantage after another to the enemy. That's much harder to do when the war is at its height, enemy bombers are striking your industries, and the consumption of equipment begins to drastically outstrip production. But that's also when Hearts of Iron 4 is at its most enjoyable. A good offensive that encircles and destroys 12 enemy divisions isn't just a nice maneuver, but it represents the destruction of months of production and training. Unleash your new tanks on the enemy following a long-awaited upgrade, and it's thrilling to see the increased hitting power of your armored units. Assuming you can see it. Like all Paradox games, Hearts of Iron has a problem with making its combat palpable and intuitive. There are so many variables at play during a battle, and each unit has so many different statistics that influence its performance in different circumstances, that the combat system becomes opaque. You can see the effect of next-generation weapons when they arrive on the battlefield, until their counterparts appear, but it's incredibly difficult to see the impact that a new element of the "mass assault doctrine" has on your armies, or what the hell a signals company is really doing for your units, especially when you consider that they're involved in battles with dozens of other such units. That's not a deal-breaker, because just knowing basic things like "I have and tanks and they have infantry" is good enough to drive most decision-making, but it means that a lot of the nuance promised by the research and unit-design system is completely hidden away inside cryptic stats and an automated combat resolution system. The tool works brilliantly for big, front-wide maneuvers, where you just want to drive the enemy back and don't really care too much about the particular. It's less successful when trying to design complicated breakthroughs and encirclements. Your armies want to turn into dispersed blobs, despite the fact that's usually the least effective way of fighting. It can be mitigated with some careful planning and attention, but it is disappointing that you can't just orchestrate the mass maneuvers of operation Barbarossa and then watch it all unfold. Instead, you'll often be fighting your units' AI to ensure that an armored thrust doesn't turn into an armored bump. Still, it works perfectly well for taking most of the busywork out of your hands, and it's not an unreasonable to ask the players to be their own Guderians and Montgomerys when finesse is called-for. With this AI weak grasp of tactics, though, finesse isn't really a requirement. While it's perfectly capable of fighting a war along a contiguous front, it doesn't do much to surprise you. It will occasionally concentrate forces, but most of the time it's content to let warfare degenerate into an unbreakable rugby scrum. More serious is the fact that it seems to struggle with opening new fronts or employing naval invasions effectively, which means the Pacific theater never quite looks right if it's left in the hands of the AI. Meanwhile, both the US and UK seem content to launch endless coastal raids rather than concentrate their forces and open a new front. The AI's questionable employment of its own power is probably one reason Hearts of Iron IV doesn't feel too terribly stacked against the Axis, despite the fact that a war on this scale can also start to feel a little pre-determined by industrial capacity. At a certain point in a long game as Italy, I checked the score screen and realized that while I had over 70 military factories churning out war material, and tons of new factories on the way, the Allies had easily five times that many working against me… and the Soviets were just biding their time on my border. If they were putting those forces but futile Alpine assaults and random landings in Africa, I'd be defeated in a heartbeat. The AI issues often do make it feel like you're going it alone, which can make it hard to find a way to counter the overwhelming power of certain adversaries. France has so many early penalties against it that building up an army that can take-on the Germans in 1939 is almost hopeless… which would be fine, except that Britain may or may not show up to the war. It's less Perfidious Albion in Hearts of Iron than Absent-Minded Albion (whoops, forgot to garrison Gibraltar again! ), and that makes fighting the Germans in Europe pretty hard. If you look at the details of Hearts of Iron, it's no surprise that the seams and cracks in the simulation begin to show. If you look at the details of Hearts of Iron, it's no surprise that the seams and cracks in the simulation begin to show. That's to be expected for a game that lets players reshape and reimagine World War 2, with god-like control over the politics, diplomacy, and military strategy of the era. 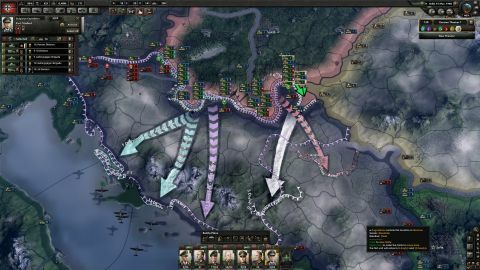 The AI may not always be sensible, and maybe combat doesn't always seem quite historically accurate, but then, you might be playing a version of World War 2 where Italy broke away from Germany to create a new Roman Empire with Yugoslavia, and the Soviet Union was plunged into civil war and Stalin was deposed by 1942. The other day, I was playing multiplayer and my friend decided France should go Fascist by 1938, leaving war-mongering Neville Chamberlain in an awkward position as he tried to find allies to help fight alongside Czechoslovakia. If that all sounds like amazing fun and games, you're right. It makes for a surprising amount of variety within the constraints of the overall scenario, but it also means Hearts of Iron 4 is a game where there's not much apparent difference between the factions, just different flavors of ideology. Hearts of Iron 4 doesn't so much as glance at the nature of the regimes involved in the war except insofar as they affect the overall war effort. That's an understandable decision, it would be neither fun nor insightful to have the game constantly pointing out that, hey, Nazis were evil! At the same time, as I watched the casualties climb higher and cities bombed daily, I did become increasingly conscious of the ways that Hearts of Iron 4 carefully maintains its moral vacuum. You get a beautiful, thrilling wargame out of that bargain. While I found a number of flaws when I stood close to the tapestry, it's important to remember that Hearts of Iron 4 exists to encompass the whole sweep of the war. It captivates me because—imperfectly, impressionistically, and perhaps a little amorally—it lets me orchestrate the most titanic armed struggles in history, from the fussy economic details to the cut-and-thrust of mechanized warfare. There are other great strategic-level wargames out there. But I have never played anything like Hearts of Iron 4.